On 13th June Italy played its first match of the European Championship 2016 against Belgium. The football was the perfect excuse for Rich Mix, the Shoreditch independent multi-arts venue stretched over five floors, to organise an all-Italian event, inviting Amaraterra to perform on stage after the match, either to celebrate a victory or cheer the audience up in case of defeat. Italy won and everyone danced the night away, but no doubt that would have happened anyway, given the compelling energy of Amaraterra. Amaraterra play the traditional pizzica folk songs of Salento, the southernmost part of the Apulia region, located on the heel of the Italian boot. According to popular belief, pizzica dances and music were born as a form of therapy for the bites of the Tarantula wolf spider. Bite victims had to indulge in this frenetic rhythmic dance in order to be healed. With time, however, the ritual transformed into more festive forms and the music is still appreciated, listened and danced to today in the squares of Salento towns and beyond. 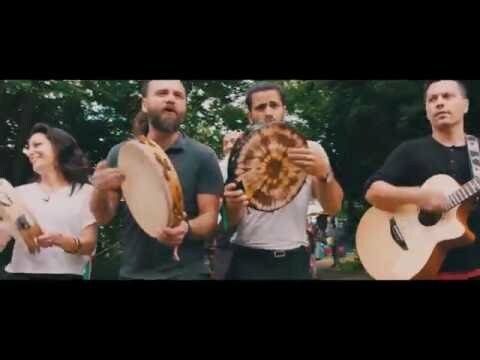 Amaraterra started as a group of passionate expats but transformed soon in a multi-national ensemble that employs the instruments of other folk traditions and is definitely influenced by the cosmopolitan atmosphere of London. We met with Alfredo Giani (mandola, guitar, vocals), Carla Pandarese (vocals, dance) and Massimiliano Passante (tamburello, vocals), three out of the ten members, to know more about how Amaraterra was born, what it is like to play pizzica in London, and much more. Rhythm Passport: How was Amaraterra born? Carla: When I moved to London – for reasons not related to my musical career – I noticed that there was no pizzica around, no one playing it. I used to dance and play pizzica back in Italy and I wanted to keep doing it, so I posted an ad on Gumtree, looking for people who might be interested in playing together. It was around 2009, I think. Massimiliano: I arrived in London a year later, in 2010. I had not been playing in a band for 5 or 6 years but I also thought starting a pizzica project could be a good idea. I posted an ad on Gumtree too and that is how Carla and I met. At the very beginning there were five of us: Carla, Lorena, our first manager, Antonio Fersini, who plays the guitar, Simona De Leonardis, singer and dancer, and myself. We tried to start something but had little experience in building a group and I have to admit it was not a smooth start. Alfredo: I also saw the ad. I am not from Salento [where pizzica originates], I am actually from Campania [i.e. the region of Naples], but I was not new to this kind of music, I liked it a lot already. I had played in many bands in my life, from traditional Neapolitan music to rock, and prior to moving to London I was very active as a musician in Padua. When I moved to the UK I missed playing, so I looked for other people and stumbled upon their ads. Massimiliano: We spent the first year gathering musicians and trying to build a repertoire. Our very first gig was in July 2011. Alfredo: However, our current formation was reached around two and a half years ago. In the last few years, we’ve grown a lot as a band. We performed more and more often, had a residency at Jamboree which made us known to the general public, and then in October 2015 we finally released our first EP, Tradizioni, which helped us gain the attention of professionals in the industry. [Amaraterra were guest on the BBC Radio 3 World on 3 show hosted by Lopa Kothari in February]. I would say this year has been the most successful so far. Jamboree is now always sold-out. Rhythm Passport: Not everyone in the band is Italian. How did non-Italian members become involved in playing pizzica? Alfredo: At the beginning we were playing in Italians delis. Mark [Glanville, baritone] happened to be there once and fell in love with the music. He studied ancient and medieval Greek and was fascinated by Griko, which is a dialect of Greek origin that is spoken in some areas of Salento and in which some pizzica songs are sung. Stelios [Katsatsidis, accordion player] and Cassandre [Balbar, recorders and Galician bagpipe player] were contacted by me. Stelios is Greek, my wife is half-Greek, I am into Balcanic music, so that’s how we met. Massimiliano: They like this music because it gives them the possibility to express themselves, to break the rules and improvise, to do something different from what they usually do. Rhythm Passport: Since there are non-Italian members who play instruments alien to he pizzica tradition, would you say the kind of pizzica you play is not traditional? Carla: Our pizzica is different from the pizzica which is played in Italy. Each member has his or her own style that of course gives a special flavour to our music. Alfredo: Either you follow the tradition strictly, making what I would call ‘museum music’, or you make fusion music. But our music is actually neither museum music nor fusion. We make traditional music in a traditional way but since we are not in a traditional setting but in a cosmopolitan city like London, in some way our pizzica turns out to be slightly different from the original one. But I cannot tell how and why exactly. Massimiliano: The truth is, even in Italy they don’t play ‘real’ pizzica. They are trying to modernise it and develop it, often using electronic instruments. We do not do that though. We are an entirely acoustic band, we play in a traditional way, but all of us have different experiences and backgrounds. Our music is a modern mix of old traditions. Carla: I would say our merit is to have transformed many songs that might be boring or slow, which in Italy would only be listened and not danced to, in danceable ones. Rhythm Passport: How is your music received by the London audience? Massimiliano, Alfredo & Carla in unison: They love it. They have so much fun. Massimiliano: I think this is because this music gives them the opportunity to escape, to let go, to dance and sing and forget everything. It’s music you rave to, that makes you sweat. A lot. Rhythm Passport: Have you ever played in Italy and if not, would you like to play there? Carla: It would not be a bad idea to try playing in Italy. We have never done it before and maybe we would enjoy it. But I am not sure how the audience would react, because people are less prone to dance and let go in Italy as they are here. I am afraid they would listen to us standing still. Alfredo: I must admit I like that we are a band from London. I do not believe I am missing something because we are not playing in Italy. If we could play in Italy though and be recognised as a London band, then that would be very satisfying. But I am happy with what we are doing here and I do not see playing in Italy as a bigger achievement. Rhythm Passport: What have you in store for the future? Alfredo: We would like to release another EP. We are very happy and satisfied with our EP Tradizioni but would like to make a longer one and record it in a big fully-equipped studio. I hope we are going to be able to tour the UK soon, perhaps even hold gigs in other places in Europe, and also play on the main stage of a renowned festival. Massimiliano: We are going to play at WOMAD this year, on July 29th, on the BBC Radio 3 Charlie Gillett stage. It is going to be our first time at the festival and we are really happy and proud of it. Rhythm Passport: One last question, what do you think of the label world music? Massimiliano: It depends on how you use it. I do not dislike it, I think we are part of this big world project, we are also a pretty mixed and international band, not only in terms of country of origin but also in terms of experience and background. Carla: We are not simply traditional, we are not simply folk… I guess ‘world music’ might fit then. Alfredo: Whether you like it or not, you need a label. The problem is that world music includes many things that I don’t like. ‘Traditional music’ doesn’t work either. People would then expect you to wear traditional clothing. And by the way, we do not live in a traditional world. I like ‘roots’. ‘Roots’ is cool.